Tilliander - Expect Resistance. Vinyl LP. Bleep. Dub On Arrival, the new sub-label of iDEAL Records, kick off with not one but two 7” releases. Along with Jay Glass Dubs’ excellent ‘Thumb Dub’/‘Index Dub’ we get ‘Expect Resistance’/‘Respect Resistance’ from Swedish veteran Tilliander. 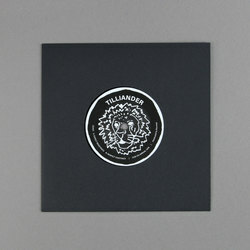 These tunes see Tilliander slow down his brand of wintry techno until it turns into a dubby syrup. Sloping bass drums and ever-echoing snares linger amid the arpeggiated synths on both tracks. There is a hint of an acid bassline to ‘Respect Existence’, but really these out-in-the-ether tunes are more ‘morning after’ than ‘night before’. Imagine a far more downbeat interpretation of Andrew Weatherall or Kambo Super Sound.